In the first blog on my Radical Re-Inventions Project, I want to explain how I plan to write textbooks for middle-school teachers and students on staging a school pantomime production. As a writer of seven textbooks (six for drama education and one for P-6 project-based learning), I am keen to understand the prospects for ‘teacher authors’ like myself who now are writing classroom resources in a digital age. Firstly, I take into consideration the effects of digital disruption in book publishing and the advent of self-publishing. In the past two years, I have been part of a creative team which has worked to define a ‘self-publishing workflow’ for writers. Contrary to the ‘magic bullet’ approach which often accompanies technological solutions to complex problems and processes, self-publishing opens up many issues which require an original approach that matches the writer’s purpose. This is because, as Norm Friesen and Rainer Leschke argue, printed books are not replaced simply with an ‘ebook’, but a variety of media and the systems of production around them. With this in mind, I imagine the pedagogical implications of learning in embodied and mediated ways. I am particularly interested in research and writing in education and the performing arts which utilise new discoveries by cognitive scientists to understand learning and performance theories, in particular around audience engagement, as well as the development of performance skills & techniques. I believe that imagining, planning and producing classroom-based resources that enable students and teachers to work together on school pantomime productions holds radical possibilities. Not only must I consider a reconfiguration of textbook content across different media, I must also consider the learning purposes and principles which I believe the resources are focused on implementing. Blending these together, I hope to enable school communities to create their own unique production. What lessons can we draw on from histories of popular theatre that show the rise of pantomime in English theatre? Historically speaking, the choices artists have made (and continue to make) creatively, financially and politically within the theatre industry seem remarkably similar today as the current generation of school leavers who are facing work in a ‘gig economy’. Moreover, given the work of anthropologists and sociologists like Victor Turner and Erving Goffman on dramaturgy, the ‘world-stage’ theatrical metaphor has been used extensively in the past fifty years to explain human organisations and management systems. However, it has been only in the last five years that theatre historians have used such sociological knowledge of drama to intersect with developments in cognitive science. Subsequently, theatre historians such as Bruce McConachie and Amy Cook have argued the case for the crucial way in which the act of viewing theatre has developed human cognition. In Evolution, cognition, and performance (2015), Professor McConachie explores how, in evolutionary terms, the development of conceptual integration, also known as ‘conceptual blending’, enabled humans to blend the concept of ‘self’ to with the concept of ‘character’. Thus arose the species-wide ability of human role-playing: a ‘subjunctive’ form of play in which a hypothetical action gives rise to better memory, mimicking, remembering and reading the salient features of a situation’. McConachie shows how conceptual blending is also necessary for the development of grammar, the understanding of analogies, and the cause and effect process. noun a book used by students as a standard work for a particular branch of study. textbook ABC, arithmetic, catechism, crammer, geography, grammar, hornbook, institutes, primer, reader, schoolbook, special, speller, spelling book, text, writer (Obsolete); workbook copybook. teachings catechism (Obsolete), doctrine, doxy, koan, prescribed text, set book, text, textbook, workbook. I find Friesen’s question a useful one to consider as I plan writing a textbook on staging school-based pantomime productions. I am only too aware that my own teaching career exists because of the progressive reforms in education in the 1970s and 80s which gave rise to the inclusion of specialist performing and visual arts curricula in K-12 education. Coincidentally, Ken Robinson is a Professor of Arts Education at the University of Warwick from where he first proposed his long-ranging views on creativity in All Our Futures: Creativity, Culture, and Education (The Robinson Report) for the Blair Government in 1998. The ‘Creative Partnerships’ program which was implemented as a result of the report in UK schools could, arguably, be another example of Friesen’s point that progressive educational practices tend to fail or be discontinued. The ‘Creative Partnership’ program ceased to exist in 2009 and the last decade has seen schools subject to test-based literacy and maths assessments more than ever. Friesen’s question is also an important one with respect to warnings arising from research by Foundation for Young Australian on how schools should respond to the changing nature of work. How do cultural and pedagogical values that might develop the entrepreneurial skills needed by workers in a ‘gig economy’ relate to the use of educational media forms of the textbook and lecture? 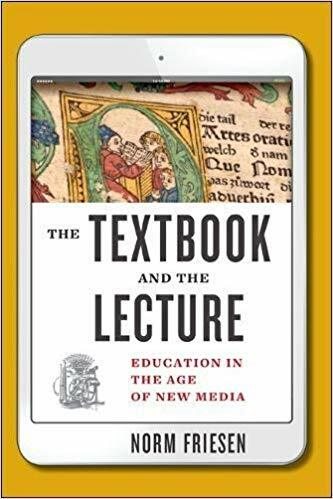 In subsequent blogs, I want to draw out Friesen’s arguments on the use of educational media forms. I want to apply them to creating educational media forms that effectively enable middle school teachers and students to collaborate on producing an original school pantomime production.